Spilling vibrant colours onto the Wells Road in Totterdown, Floriographysits among an array of independent shops. The exterior walls are hidden by a climbing-plant, blurring the brickwork into the windows, which are filled with big hand-painted signs and leafy potted plants. 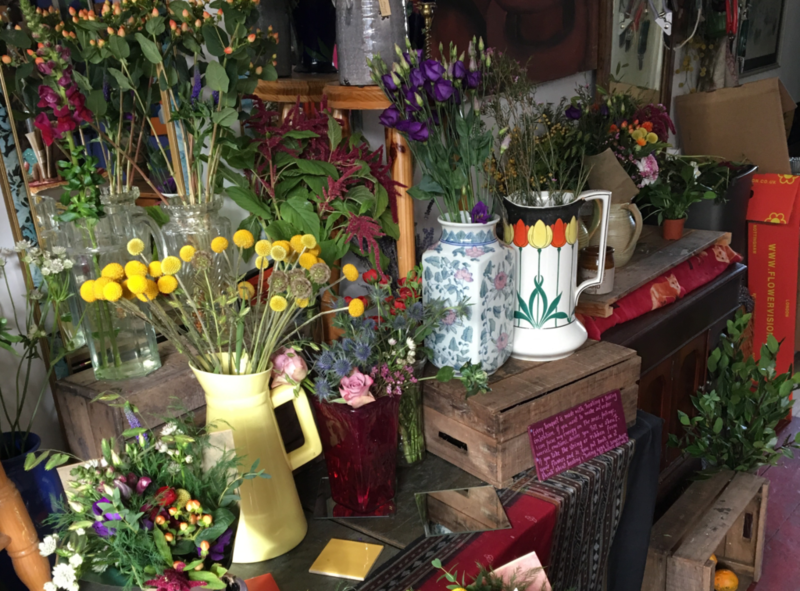 Inside you can find a carefully selected display of art and gifts, as well as flowers. Mirrors and paintings cover the walls, with any space left in between hidden behind plants. Succulents and cacti cover any empty surface space, a jewellery-filled cabinet stands shining next to the till and there are two blessing bowls: wide glass bowls filled with water and flower heads. Floriography have changed location a couple of times since opening in 2014, but always remained loyal to the local community. “It doesn’t matter where the shop is, the concept and values will always continue, and we can just shape another space,” Vera says. Floriography means ‘the language of flowers’ and Vera believes that this is the most beautiful form of communication. Through her understanding of people’s stories and feelings, she uses flowers to help customers create connections with others. Vera is determined to create memories for her customers by portraying real feelings through floristry. The amaranthus is one of the many bold bunches bursting off a round wooden table that showcases Vera’s pre-made bunches. “I love the astrantia flowers, little white flowers with pink flecks. Its name means star in Greek and it’s very beautiful. When I use it in a bunch, I think of it as a shining star for those who need some light,” Vera continues.